If you need to buy tiles for your home or garden area then take a look at the selection available here. They are the perfect addition to any Mexican or even Spanish style home. 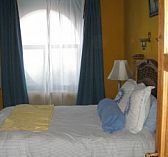 Their bright and festive colors are enough to bring a lot of color to your chosen room. They are also the perfect way to decorate your home with a lovely Mexican style and to create a gorgeous Mexican hacienda. 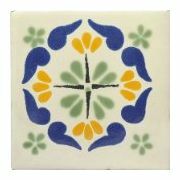 Many of these tiles have been hand painted and are made Talavera style unless stated otherwise. They make wonderful decorations for kitchens, bathrooms and even patio areas. You can also buy some to use as coasters for your cups. What a great way to show some style by your coffee table area. You can also display tiles or decorate them over a pretty rustic dresser! 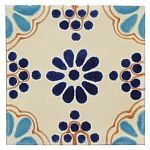 Talavera tiles are usually handcrafted and due to this are not always perfectly square or completely the same width. Many have measurements of 1/4" but this will always vary. Check with the specifics of each manufacturer to get sizes as I have several listed here that may not be from the same company. Tiles are also great for decorating your gorgeous counter tops. Imagine walking into your kitchen to be greeted with beautiful Mexican tile displayed. 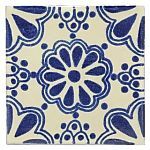 The tile alone is a wonderful upgrade to any kitchen and adds Mexican flair just where you need it the most. These tiles are also wonderful splashes of color for the patio area. Just be aware that due to the porous nature of clay, they are not frost proof and may crack in freezing weather. They are absolutely perfect for the indoors and can add beauty and a lot of pizazz to your home!